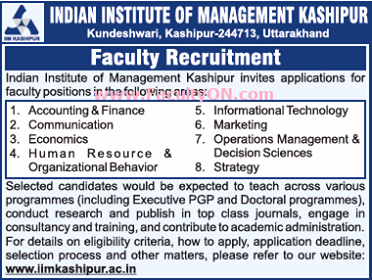 Indian Institute of Management , Kashipur has advertised in THE TIMES OF INDIA newspaper for the recruitment of Professor/Associate Professor/Assistant Professor job vacancies. Interested and eligible job aspirants are requested to apply with in 21st June 2018. Check out further more details below. About College: The Indian Institute of Management Kashipur is a new entrant in the elite league of IIMs. The institute is set up with the objective of providing quality management education while sensitizing students towards the needs of the society. IIM Kashipur commenced operations from July 2011 under the mentorship of IIM Lucknow. How to Apply: Interested and Eligible candidates are requested to apply online in the prescribed format only.